How do you “teach” things that don’t fall neatly into subject categories? When you’re following curriculum, learning is chopped up into bite-sized pieces, which are supposedly easier to swallow (and to test)… but what about all of the tangential topics that don’t get covered this way? I don’t profess (ha! see what I did there?!) to know everything about teaching or learning or education. But I do think there are many advantages to skipping the individual subjects and approaching education in an organic, whole-learning fashion. And I am a really big proponent of just learning by living, because who can think of all the things you might need or want to learn about otherwise? This thought occurred to me because I found a list of fonts S13 had written down. 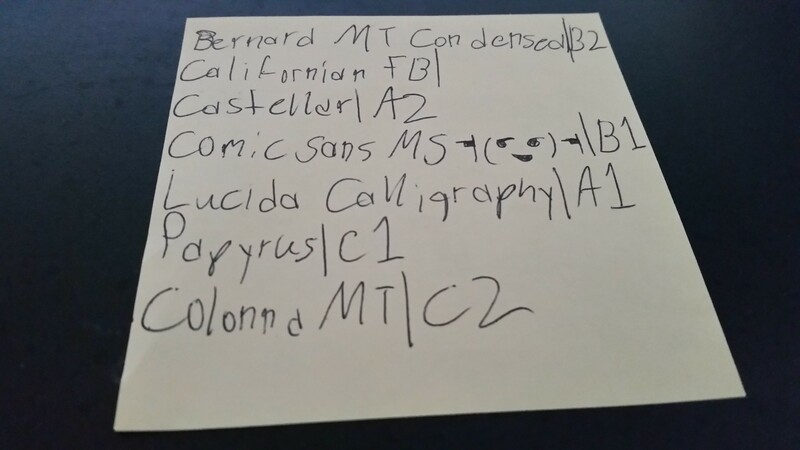 She was making labels for her birthday party, and wanted the perfect font to go with her gaming-fandom theme. How do you learn something like font-choosing without actually getting in there and choosing fonts?? I guess you could take a class on typography, but what 13-year old is doing that? And yet, font-choosing is something you’re a lot more likely to do in life than, say, balancing a chemical equation. Not saying that fonts are more important to learn about than chemical equations. But they’re definitely more likely to be something you encounter when you’re grown and doing your own thing. It’s fascinating to me that we ply kids with highly specific and arbitrary knowledge, which will only be important or useful to a very small percentage of them, yet we deny them the opportunity to learn about things that nearly everyone will use at some point, no matter what they end up doing as adults. I think the best way to learn what’s useful in life is to just get in there and start living it, and you’ll learn all sorts of things. Maybe chemical equations will be one of those things. Maybe they won’t. But I’ll argue that if you spent time learning chemical equations as a kid, and never needed them as an adult, you probably could have spent that time choosing fonts instead and been just fine. And if you didn’t learn chemical equations as a kid, you can probably pick up that knowledge quickly and easily if it’s really important to what you want to do as an adult. Posted on April 28, 2017 April 28, 2017 by JenPosted in CommentaryTagged life skills, unschooling, writing.